Kindle Fire HD comes from a family of e-readers, so it’s only natural that the e-reader you use to read books on the device is a very robust feature. 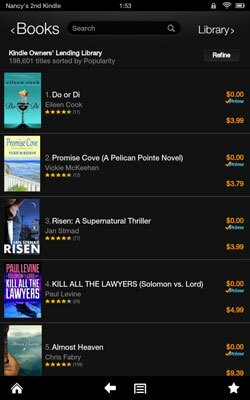 Kindle Fire HD makes it easy for you to buy your content from Amazon. The content you buy from Amazon is automatically downloaded to your Kindle device, which means that not only is buying from Amazon’s bookstore easy, but you can take advantage of their vast selection of books. In addition, you can borrow Kindle versions of books from the Amazon Lending Library, as well as borrowing from many public libraries. You can also lend books to your friends. Amazon has also made deals to make many of your favorite magazines and newspapers available. With magazines and newspapers, you can buy the current issue or subscribe to get multiple issues sent to your Kindle Fire HD as they become available. To buy books or magazines for your Kindle Fire HD, on the Home screen, tap either the Books or Newsstand button, which takes you to your Books or Magazine library. Tap the Store button; this takes you to the Amazon Kindle bookstore. 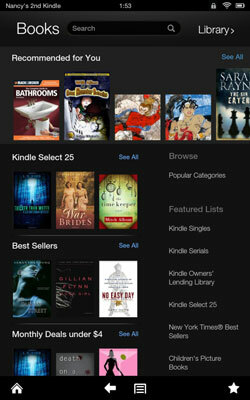 You can also buy content at the Amazon website from your computer and have it download to your Kindle Fire HD. Just select what device you want it delivered to from the drop-down list below the Add to Cart button before you buy Kindle content. Amazon uses a technology called Whispersync to download books and magazines to your devices. All but the 8.9-inch 4G LTE model of Kindle Fire HD require a Wi-Fi connection, so you need to be connected to a Wi-Fi hotspot to download publications. On the screen that appears when you enter the Store, you’ll see a Kindle Owners’ Lending Library link on the right side of the page. Tap this link and a list of free lending selections appears. These free items are only available if you have an Amazon Prime membership. Tap on an item and a descriptive page appears. Tap the Borrow for Free button and your selection is immediately downloaded. You can borrow a title from the Lending Library approximately every two weeks. More than 11,000 libraries in the United States lend Kindle versions of books through a system called Overdrive, which allows you to easily download books to your Kindle Fire HD. The time you can borrow a book varies by library, and each library may have a slightly different system for borrowing books. Go to your library’s website and search for e-books. Note that you’ll need a library card and PIN to borrow books. Click the title you want to check out and then enter your library card information and PIN. After you check out a title, choose the Get for Kindle option. You may then have to enter your Amazon.com account information to borrow the title. Choose the title and the device you want the book delivered to; then choose Get Library Book to download the title to your Kindle Fire HD.